Foundry Monoline is an elegant, modern typeface, which is particularly suitable for editorial, promotional and advertising use. 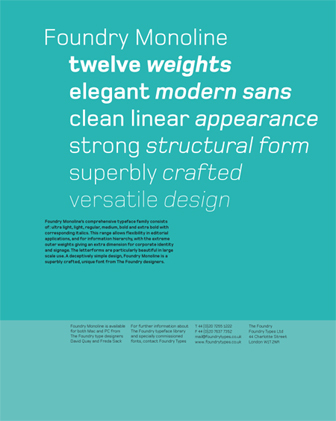 It is available in seven weights: ultra light, light, regular, and regular, demi, bold and extra bold. The ultra light and extra bold give an extra dimension when the typeface is used across body copy and headlines; the letterforms are particularly beautiful when used at larger sizes.The clean, linear appearance of Foundry Monoline has been created using a structured grid system. It is a deceptively simple design – careful optical adjustments have been made to give the appearance of a single-thickness stroke, producing a superbly crafted and workable typeface. In 2000 I lived for one year in Wiesbaden, Germany. Every morning I would stroll down the street were I lived to the café in the square below for my breakfast. On the corner of our street was a shop specializing in products for the elderly. The window was full of: wheelchairs, potties, nappies, support stockings displayed in a haphazard manner. A large white sign in Eurostyle covered the whole length of the shop sides. It was ugly and even at night it glared it garish light in the streets around. I started to think on how I could make a softer squarish typeface that could replace the Eurostyle on the sign. Sketching on a paper napkin while drinking coffee on my café terrace one sunny morning I came up with Monoline. I worked hard on it for a year. It has been one of the most successful Foundry typefaces ever since.